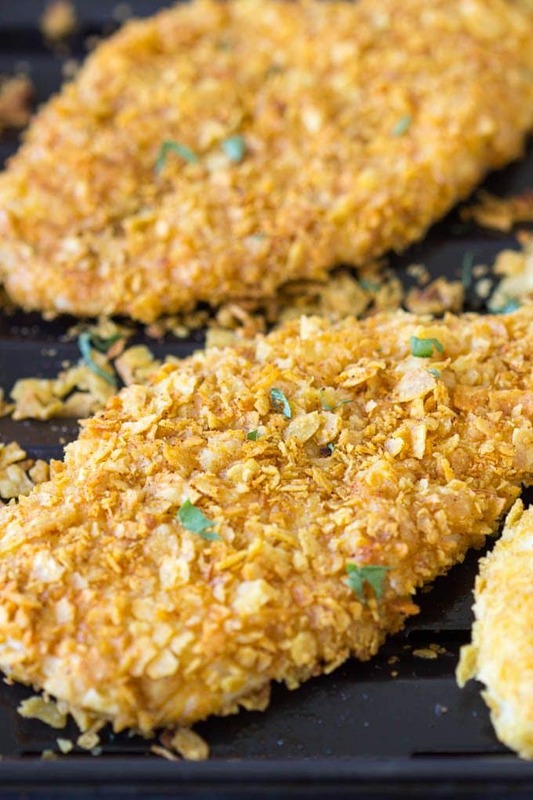 Crushed up tortilla chips + taco seasoning makes for a crunchy and flavorful coating for chicken breasts (or chicken tenders). What’s not to love?! You can have dinner on the table in about 20 min. start to finish! Another confession…crushing up the tortilla chips is FUN! Something about just grabbing a big ole handful and squeezing …o.k. o.k. I’m easily amused. It certainly would be a great task to have kids help with the dinner prep. Place a bunch of chips in a big ziplock bag and let the kids go to town! If crushing with your hands is not your thing of course you could always let the blender or food processor do the work. Once the chips are crushed up you’ll mix them with some taco seasoning in a shallow bowl. You’ll need two more shallow bowls. One for the flour and one for the lightly beaten egg. 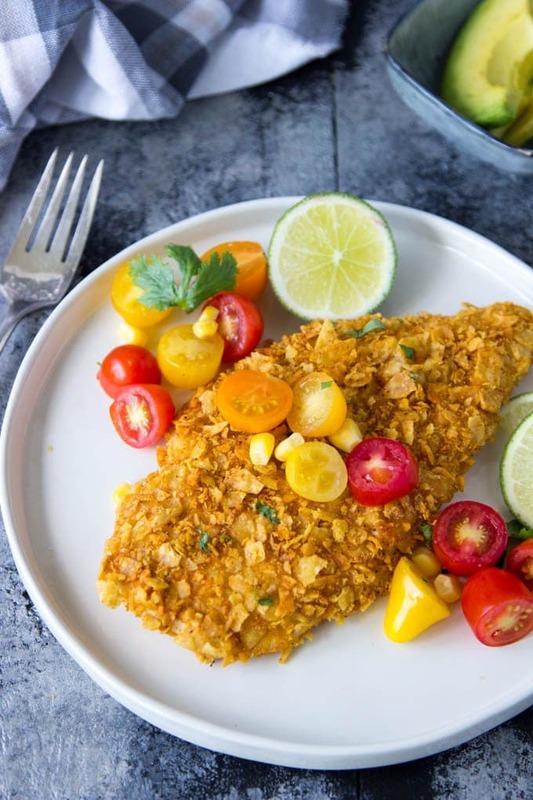 Dredge the chicken in flour, then the egg, and finally the crushed up tortilla chips. Pop it in the oven for 10-12 min. and that’s literally all that’s required to make this Tortilla Chip Taco Chicken. Easy! There are SO many ways to serve this chicken. 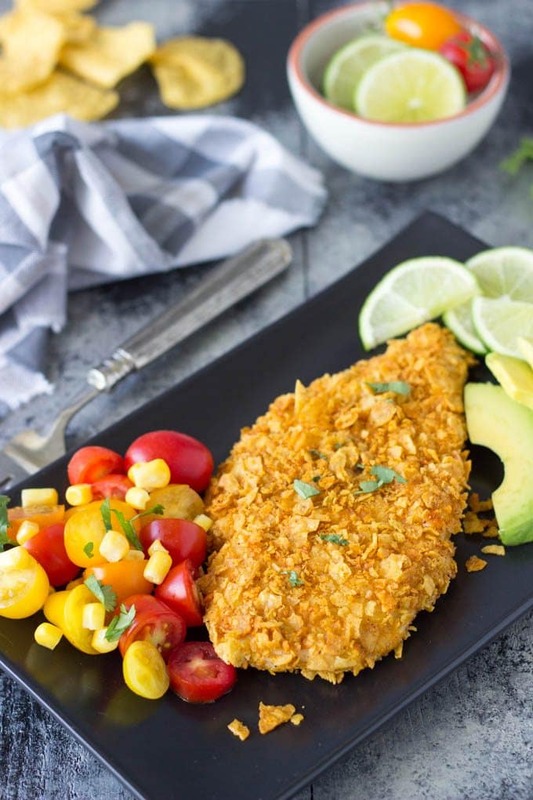 Top chicken with taco fixin’s like avocado, tomatoes and salsa. 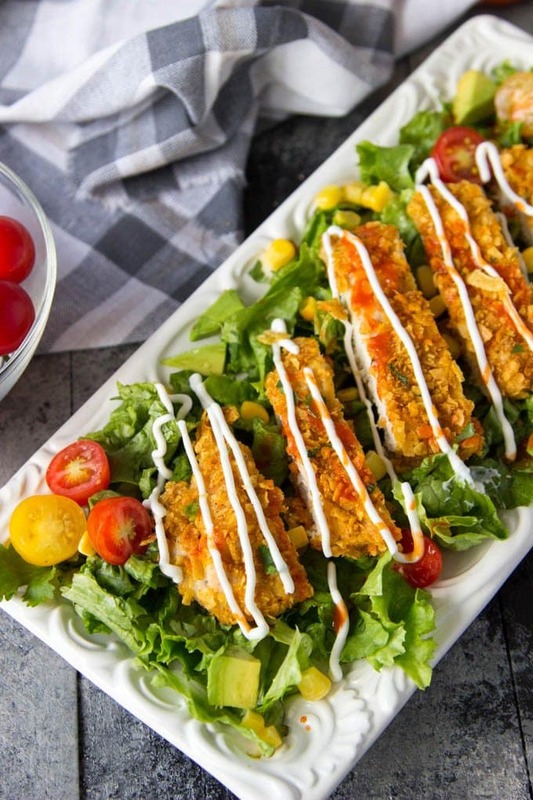 Slice the chicken up and serve on top of a bed of fresh salad greens, top with corn, tomatoes, avocado and a drizzle of sour cream. Limitless options! Wash and pat dry chicken. Set aside. Crush tortilla chips (with hands or in a food processor/blender) and add to a shallow bowl. Add taco spices and mix to incorporate. In a second shallow bowl add flour. In a third shallow bowl, add egg and lightly beat with a fork. Dredge chicken in flour;then dip in egg and roll through the tortilla chip crumbs, patting gently to coat. 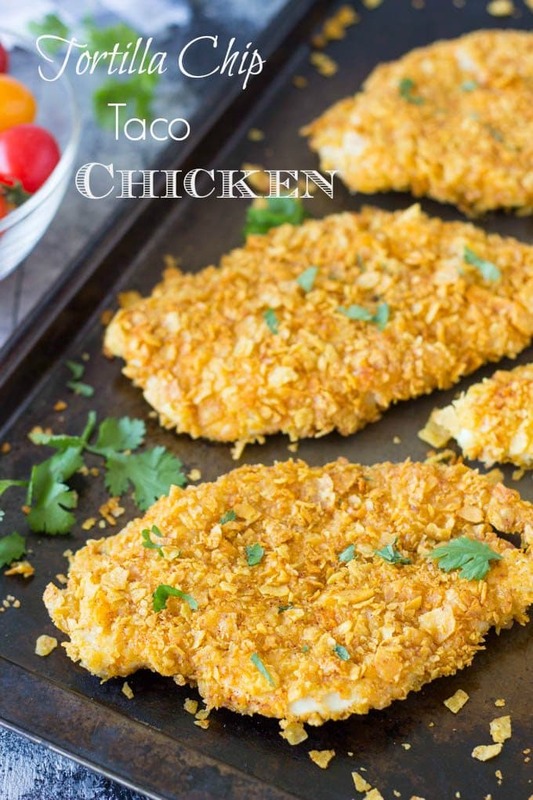 Place coated chicken to prepared baking sheet. Repeat with remaining chicken pieces.Bake until chicken is cooked through 10-12 minutes. I Love Your Taco Chicken Recipe… Thanks.